The story of the struggle against obesity shares a common thread with the struggle against violence. The commonality is in economics. Many people focus on the health effects of weight. This is important, but it often leads people to miss the financial toll that being overweight takes on its victims. I have detailed this in my book (more info on the book can be found by clicking here) but a recent report really brought to life the extent of the economic impact of excess weight. The McKinsey Global Institute consulting firm has just released a report focused on the economics of obesity that is quite shocking. They have found that the global cost of obesity is nearly $2 trillion a year. The costs are nearly as high as those due to smoking or the combined impact of armed violence, war and terrorism. It puts its impact at 2.8 percent of global gross domestic product. The company says 2.1 billion people — about 30 percent of the global population— are overweight or obese and that about 15 percent of health care costs in developed economies are driven by it. $19.39 in added annual health care costs for every overweight pound on average, but the cost increases with age. For someone age 25, the added annual health care cost is $209 for the overweight and $960 for the obese. By age 64, this grows to $610 extra for the overweight and $2,300 for the obese. A person who is 25 and obese today, and remains obese until they’re 65, will average $179,000 more in health care costs (in 2009 dollars, assuming health care inflation of four per cent a year) over those 40 years. Research sponsored by the CDC showed that overweight and obese individuals spent close to $1,429 more on health care each year than normal weight individuals. The above is an estimate of the extra cost to you from increased health-care expenditures. If you’re obese, you’ll likely be spending more on doctor visits, medications for your many chronic conditions, and potentially hospitalizations for serious conditions. This doesn’t account for the lost opportunity cost of that money. What could you have done with that money had you invested it? If we assume that the number of $1037.64 is the annual cost of being overweight and assume a return of 10% including inflation, your weight would cost you $459,251.74 by age 65. If things continue on the path they appear to be heading with the rising costs of healthcare, these numbers are likely to be much higher in the future. 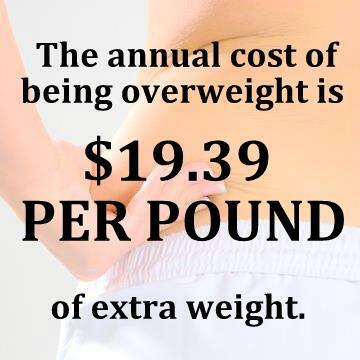 There are even more costs to being overweight. There is ample evidence that if you are visibly overweight you are likely to be discriminated against in a way that affects your income. One study found that there was a “wage penalty” for being obese of 0.7 – 3.4% for men and 2.3 – 6.1% for women. 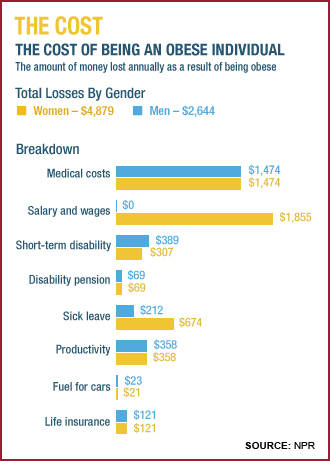 Another study in women found that an increase in weight of 64 pounds above normal led to a 9% decrease in wages. Other studies have found very obese women getting paid up to 24% less and men up to 19% less. This is not just a problem in the United States. There is evidence from other countries as well. These experimental findings clearly demonstrate that overweight and obese individuals are at a disadvantage in workplace interactions, evaluations, and employment. Hopefully this bit of information is the extra motivation you needed to change your mindset. You should consider the above costs when weighing the costs of a gym membership or the higher costs of healthier foods. You can also use this information to help empower you. 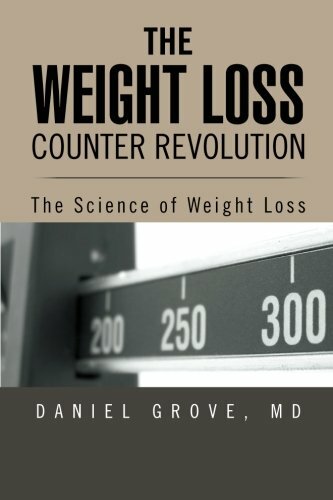 Next time you have a craving for something high in calories, before grabbing it picture all the things you could buy with that extra money if you could lose the weight. That just may be the little bit you need to push your motivation over the edge. The High Cost of Being Overweight. Health Watch Journal, 2009. (Accessed May, 2010, at http://www.healthwatchjournal.com/the-high-cost-of-being-overweight. Maranto C, Stenoien A. Weight discrimination: a multidisciplinary analysis. Employ Respons Rights J 2000;12:9-24. ← What’s in your supplements?